(Newser) – A roofer has been accused of gruesomely murdering his co-worker using a tool of the trade. 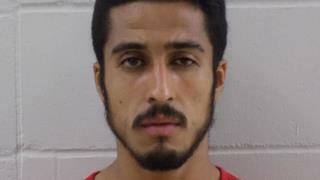 The Pierce County Herald reports that 24-year-old Miguel Angel Franco Navarro faces charges of first-degree intentional homicide and mayhem in the death of 37-year-old Israel Valles-Flores. Authorities in Wisconsin say that his weapon of choice was a circular saw and that the slaying unfolded while the two were part of a crew working atop a home outside the city of River Falls on Aug. 6. 'he got me really,really mad," i'd hate to see what he does when he gets really,really,really mad. Let's see, Mexicans, nothing new here, thought they were back home, Thanks Odumbo! You gotta watch that kick-back when you hit the bone.